Recently I set out to find the truth (or lack thereof) behind the infamous German Christmas pickle (Weihnachtsgurke) tradition. Never heard of it? Well, the story goes that Germans liked to hide a pickle in their Christmas tree and the first person to find it on Christmas morning would receive an extra present or good fortune in the new year. Here in Michigan, we have a town known as the Christmas Pickle Capital of the World. I don’t personally have one of these pickles, but I wanted to know the real history behind this interesting tradition. As it turns out, I cannot find any evidence that the Christmas pickle was actually hidden in Christmas trees in Germany. It appears to be an American German (or perhaps American Dutch) legend/tradition. 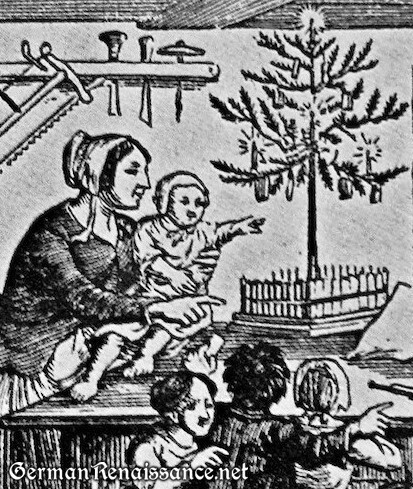 But, as it happens, I did discover something much more interesting … Christmas trees themselves may have originated in Renaissance Germany in the 16th, or perhaps even the 15th century! Need more proof? Let’s go back a bit farther. A guild of German merchants from Lubeck, Germany erected a house called the House of Blackheads in Riga. In the Blackhead’s Brotherhood Fraternity archives of 1510, there is detailed accounts of a winter tradition of a Christmas tree, and it refers to earlier account of it 1476. The accounts mention that the tree was decorated with ribbons, dried flowers, straw dolls, and possibly fruit. There is a plaque in the square that read, “The First New Years Tree in Riga in 1510.” Now while this happened in Riga, which is in current-day Latvia, the custom was written down by Germans in Old German, so that’s still German to me. There’s also the account of Martin Luther (1483-1546), who is erroneously credited with having the first Christmas tree. Clearly, he is not, but he may have popularized it. The story goes that Martin Luther was walking through the forest one day and looked up to see the stars shining through the tree branches. The sight was so beautiful that he went home and put up a tree with candles in its branches for his children. There are also accounts of a 1521 image that shows a tree being paraded through the streets with a man riding a horse behind it. The man is dressed a bishop, possibly representing St. Nicholas. I am still searching for an image that fits this description. The woodcut linked above is by an unknown artist. 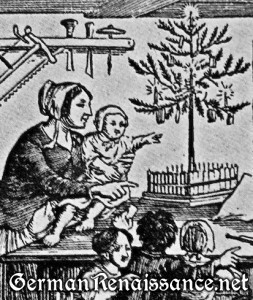 The truth is that the Christmas tree’s origins are likely to be earlier in history, but are shrouded in mystery. There is a legend that Germanic tribes worshiped an oak tree that represented Thor. When Boniface (675-754), a Christian, cut down Thor’s tree and nothing bad happened, the people began to worship God instead. Boniface declared an evergreen tree to be the symbol of Christianity. I’ve heard varying versions of this legend, but as with many stories, there is probably a grain of truth in there. What does seem clear (to me) is that tradition of putting up and decorating a coniferous tree around Christmas probably began in the Germanic region. It seems likely it evolved from other traditions, but in the end, it makes sense. A tree that remains green all year would have special significance in Northern Europe during the dark months of winter, especially around the winter solstice and its shortest day of the year (Dec. 21 or 22). I have more research to do, and I’m sadly lacking primary source citations for anything here, but as I find them, I will add them. But for now, I must go out with my family and cut down a stout Christmas tree. I think we might even hide a pickle in it this year! Enjoy your tannenbaum and happy holidays! 2 Responses to Did the Christmas Tree originate in Renaissance Germany?